This probably shouldn’t come as a surprise, but today Todd Howard confirmed that you won’t be seeing anything from Bethesda Game Studios’ next big RPGs at E3 this year. So if you were hoping for a Starfield release date or an Elder Scrolls VI release date, you’re going to have to keep on hoping for a whole lot longer. While talking about the tech behind the upcoming games at an Elder Scrolls anniversary panel, Howard stops to say “Before everyone asks, please be patient.” He adds with a laugh that “it’s going to be a long time. It’s not something we’re going to be talking about at E3, either of those games this year. So patience, please.” You can hear those comments in the Twitch archive, at around the 2:11:00 mark. Bethesda did offer the tiniest hints about the upcoming games, though. Both Starfield and TES6 will make use of photogrammetry to scan real-world objects into the game for more realistic environments and characters. 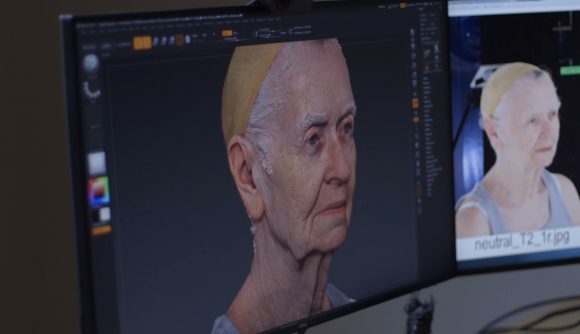 Bethesda is also capturing human faces – including that of Shirley Curry, better known as Skyrim Grandma. Fans petitioned to get her into TES6, and it looks like that’s happening. As you can see toward the end of the video below, Shirley’s face now lives inside Bethesda’s computers – so it looks like you can expect her to be an NPC in TES6. Just don’t expect to see her at E3. Bethesda’s E3 showcase will feature a big update on Doom Eternal, and probably some more details on the upcoming Wolfenstein spin-offs, too. Beyond that, whatever else Bethesda has in store will be a surprise.